The wall was built some 2,000 years ago by the first settlers of New Zealand, the Waitahas, who were subsequently nearly exterminated by the Maoris, who arrived only 800 years ago. There are political problems with this theory, for the Maoris insist they are the original New Zealanders and therefore are due compensation for lands expropriated by later Europeans. The wall is merely what's left of a sawmill built only 50 or so years ago. The wall is simply a natural rock formation that has happened to split neatly into rectangular blocks -- like those slabs of beach rock that comprise the controversial Bimini "road" in the Bahamas. Future study of the "wall" will doubtless narrow the list to one. Meanwhile, let's take a look at the wall itself. "There was no doubt that the stones had been cut. The four visible stones in the front wall were a uniform 1.6 metres tall, and 1 metre wide. In one place he could insert his arm into a root-ridden cavity and feel the back face -- and the front face of the next tier. The faces were uncannily smooth, with no saw or adze marks. The interstices where the blocks join were knife-blade thin. Needless to say, New Zealand archeologists and anthropologists are not anxious to drastically revise their fundamental paradigm assigning the discovery and colonization of New Zealand to the Maoris. 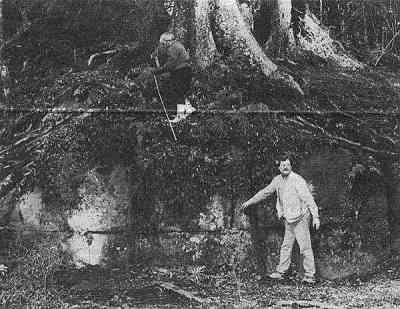 But Brailsford and Childress are even more iconoclastic: They suggest links to a pre-Polynesian culture; a culture that left similar megalithic structures elsewhere in the Pacific and along the west coast of South America. Comment. See SF#97 for an apparently natural wall at Chatata, Tennessee, that stirred up a similar controversy over a century ago. Reference. Many other mysterious walls are covered in our Handbook: Ancient Man. To order, visit here.